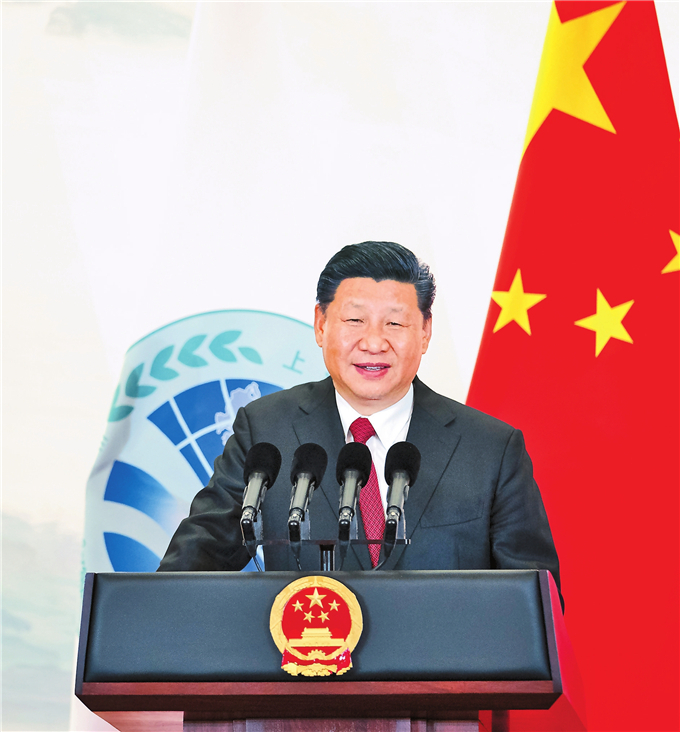 Chinese President Xi Jinping hosted a dinner on Saturday evening to welcome guests who gather in the coastal city of Qingdao for the 18th Shanghai Cooperation Organization (SCO) summit. "It is such a pleasure to have you with us here in Qingdao, Shandong Province, on the shore of the Yellow Sea," Xi said while addressing the dinner. "I wish to extend, on behalf of the Chinese government and people and in my own name, a very warm welcome to all of you, particularly the state leaders and heads of international organizations who have come to attend the meeting of the Council of Heads of Member States of the SCO," he said. Shandong is the home province of Confucius and birthplace of Confucianism. An integral part of Chinese civilization, Confucianism believes that "a just cause should be pursued for the common good" and champions harmony, unity and a shared community for all nations, Xi told the guests. Its emphasis on unity and harmony has much in common with the Shanghai Spirit, namely, mutual trust, mutual benefit, equality, consultation, respect for diverse civilizations and pursuit of common development, he said. "The Shanghai Spirit's focus on seeking common ground while setting aside differences and pursuing mutually beneficial cooperation has won widespread international endorsement and support," the Chinese president said. Guided by the Shanghai Spirit, the SCO has delivered fruitful outcomes in security, economic and cultural cooperation and made historic strides in institution building, he said. With eight member states, four observer states and six dialogue partners, the SCO has become an important force for upholding regional security, promoting common development and improving global governance, Xi said. "Qingdao is a famous international sailing capital. It is from here that many ships set sail in pursuit of dreams. Tomorrow, we will hold the first summit of the SCO after its expansion and draw up a blueprint for its future growth," Xi said. "The Qingdao summit is a new departure point for us. Together, let us hoist the sail of the Shanghai Spirit, break waves and embark on a new voyage for our organization," he said. After the dinner, Xi and the guests watched an artistic performance of lights and fireworks with the theme of "A Warm Welcome to Friends from Afar." 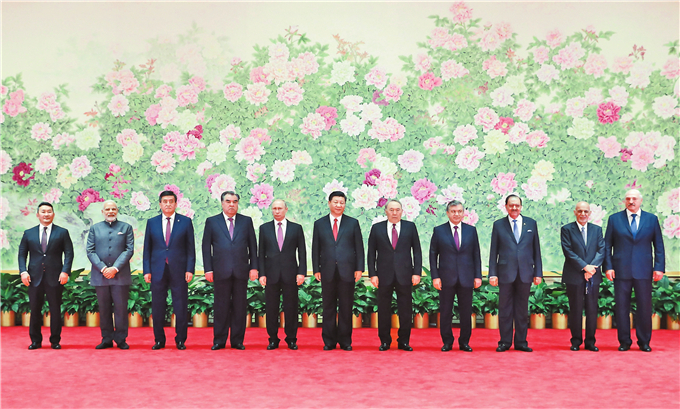 Xi and foreign leaders had a group photo taken ahead of the dinner.